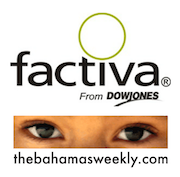 The Bahamas Weekly News Team is excited to announce that we have signed a licensing agreement with Dow Jones & Company through their business information and research tool Factiva. Dow Jones Factiva's primary customers are professional researchers, knowledge managers, senior executives and business professionals of the larger companies and organizations who require national and international news in one service. Customers usually require local language content and international news in English. "We're really excited about this partnership, as The Bahamas Weekly celebrates our 10th anniversary this year," said editor and cofounder Robbin Whachell. "To be connected to such a well-respected and world renown company is a proud moment for our team." "Being selected by Dow Jones Factiva is a major milestone for TheBahamasWeekly.com because it represents even broader global distribution of our content and it is a most fitting way to climax 10 years of serving quality news content and information about The Bahamas to the world," said webmaster David Mackey. Dow Jones Factiva provides a special collection of publications in the world and focused on the consumer, and thousands of sites around the world: more than 36,000 news sources (newspapers, journals, television, radio transcripts, news agencies, magazines and even thousands of specialized publications in various sectors and industries) in 28 languages, including more than 600 continuously updated newswires. Averaging 1 million page views per month and promoting Bahamians everywhere! From offices in Grand Bahama and Canada, TheBahamasWeekly.com provides the planet with constant web updates on the hottest topics in or about The Bahamas. Keeping you updated on news, entertainment, sports, politics, crime, community and celebrity sightings, we offer free 'weekly' news updates emailed directly to you each Friday featuring our Top 70 stories of the week. Be in the know for all things Bahamian - subscribe today or find us on Facebook and Twitter.